I always approach any record I'm sent with some trepidation. This Gutter 7" was sent over by Punk Fox who, though I have not liked quite a few of the records they have released, have kind of been on an upswing for me. Plus it was co-released with Speedowax records, a label I have known and trusted for many years. So maybe my hopes were a bit higher than they should have been or perhaps I just really had no idea what I was about to listen to, but I am absolutely not the target demographic for this record. 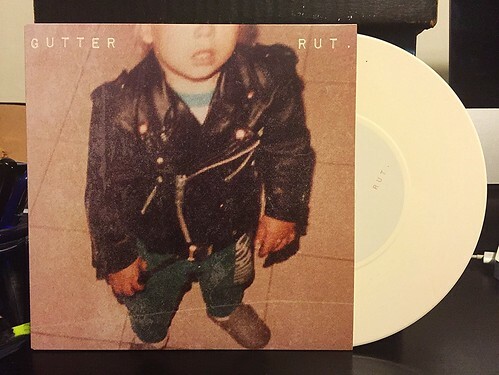 Gutter have that really slick sheen that I don't like on punk rock. These guys sound like they're making a run to be on Equal Vision or one of those other labels that put out the sort of schmaltzy punk rock crooning that has never done anything for me. It's not particularly dynamic and is really cookie cutter punk. I could see it appealing to the younger folks that have taken over the Vinyl Collective message board, but it doesn't work for me. I like my punk rock a little rougher around the edges, I like things a bit catchier and I need to really feel like the band is excited about what they are doing. Maybe the guys in Gutter love every one of these songs, but that enthusiasm just doesn't show through the recording.